The Dusky Track is one of New Zealand’s toughest hikes. Measuring some 84 km (52 mi) from beginning to end, it crosses two mountain ranges, three valley systems, and includes some of the wettest, muddiest and buggiest conditions you are ever likely to encounter. I realize that sounds pretty ordinary, however, compensation comes in the form of some of the most spectacular wilderness scenery the South Island has to offer. 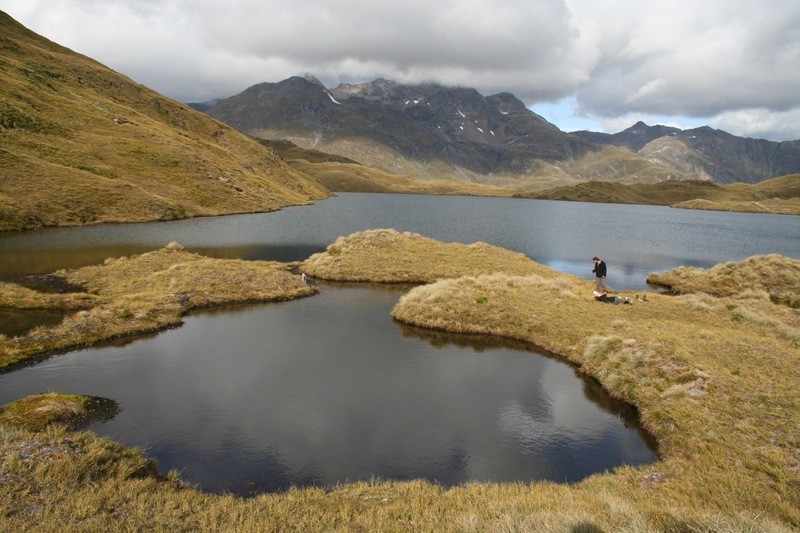 Additionally, there are wonderful lakes for swimming, lots of solitude, and the satisfaction of knowing you have completed one of New Zealand’s most challenging treks. I hiked the Dusky in early 2010. All information has been updated as of January, 2018. 7 to 9 days. This estimate can vary significantly, depending on the conditions, along with the fitness, pack weight and experience of the hiker. Strong trekkers that have a decent weather window can comfortably do the the tramp (Kiwi-speak for “hike”) in four days, whereas slower folks and/or hikers that just feel like taking their time, may take eight or nine. Lake Hauroko – Lake Manapouri. The track can be done in either direction. 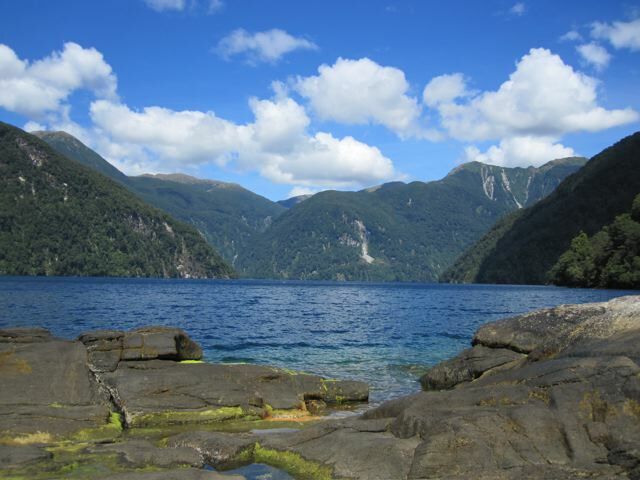 There is daily transport to and from the West Arm of Lake Manapouri from Te Anau (30 min). Access to the trailhead on Lake Hauroko is less frequent. As of January, 2018, the only regular services were with Lake Hauroko Tours on Mondays and Thursdays during the hiking season (see below). Bookings need to be made in advance. Beginning of November to the end of April. The Dusky Track is situated in the Fiordland region of New Zealand’s South Island. Freezing temps, heavy rain, high winds and snow can occur at any time of year (sometimes on the same day). Indeed, according to the DOC, Fiordland receives “an average of about seven metres of rain falls per year, over an average of about 200 rain-days per year. Don’t forget your rain jacket!” An ironic sense of humour, positive mindset, head net, and some extra food for storm delays, may also come in handy. Rainy views and misty skies. Topographic Maps: Three sheets from the Topo50 series cover the entire trek. They are CD06 Deep Cove, CE05 Cooper Island and CE06 Lake Roe. The only one you really need is the CE06, which encompasses more than 90% of the track. The sections it doesn’t cover are the initial few kilometres from the West Arm of Lake Manapouri, and the final few kilometres before Supper cove. However, in both cases the trail is obvious and a topographic map is not really needed. The Topo50 series maps are widely available throughout NZ in outdoors Stores and DOC offices, or alternatively you can download them for free from the Land Information New Zealand website. Trekking Notes: For a basic summary of each section, along with estimated hiking times, see the Dusky Track page on the Department of Conservation (DOC) website. For more detail, try Duskytrack.blogspot.com. GPS Information: See Duskytrack.blogspot.com for GPX files and elevation profiles for the entire track. 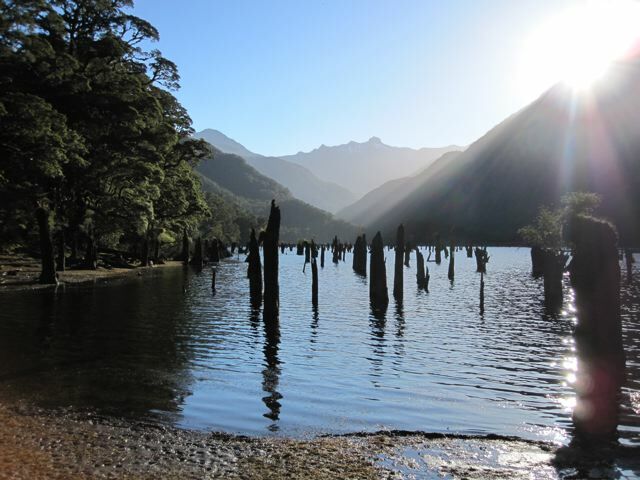 Guidebook: Lonely Planet’s Tramping in New Zealand (2006) describes the Manapouri to Supper cove section of the route, however, the stretch from Loch Maree to Lake Hauroko is mentioned only in brief. Save your money and give this guidebook a miss. 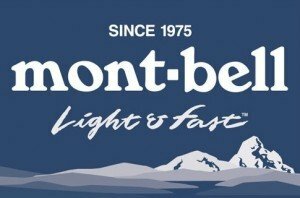 Most hikers will be fine with the above-mentioned topographic map, along with a compass and/or GPS (Note: The 2014 edition of this Lonely Planet guide doesn’t include the Dusky Track). 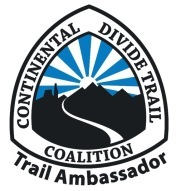 Up-to-date Information: See the DOC website for all the latest on trail closures and/or other changes to the route. Water: Plentiful. I never filtered and had no issues. Each of the huts has its own rain water tank. The trail is reasonably well marked throughout with orange blazes. The Dusky track rivals the Northwest Circuit on Stewart island for the title of New Zealand’s muddiest tramp. The going is often slow (e.g. 1 to 2 km per hour) and particular care must be taken on the descent from Centre Pass, and also the descent to Loch Maree if you are walking south to north. In addition to the mud, there are 21 three-wire bridges, numerous creek/river crossings and a constant stream of slippery, moss-covered roots and rocks to negotiate. Note that after periods of heavy rain, certain sections of the trail may become impassable due to flooding. The Lake Roe and Lake Horizon area in the Pleasant Ranges is one of the scenic highlights of the hike. In clear weather, the views west towards Dusky Sound are spectacular. Side Trip: I highly recommend doing the side trip from Loch Maree to Supper Cove in Dusky Sound. 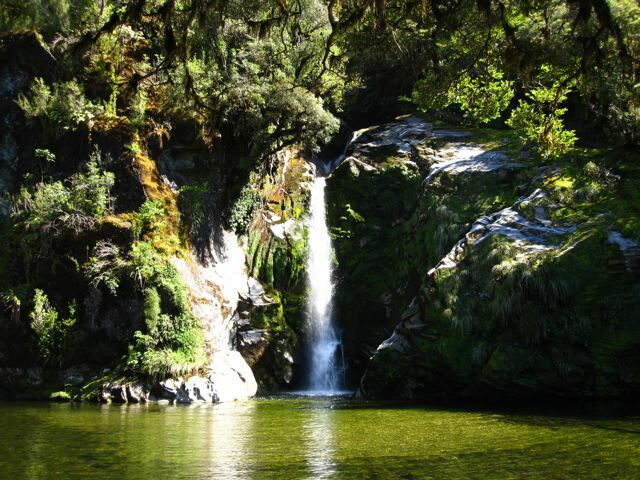 Don’t miss taking a well-earned dip at the gorgeous swimming hole/waterfall, situated about 30 minutes from the turnaround point. When the weather is fine, this place is like something out of a Tahitian postcard. This out-and-back hike can be done in a day, or even better, you can overnight at the beautifully situated Supper Cove Hut. Swimming hole just before Supper Cove Hut. Huts on the Dusky track are cheap ($5 per night), rarely crowded and provide a welcome respite from the sandflies. They all have bunks for between 10 and 12 people, and no advance bookings are necessary. 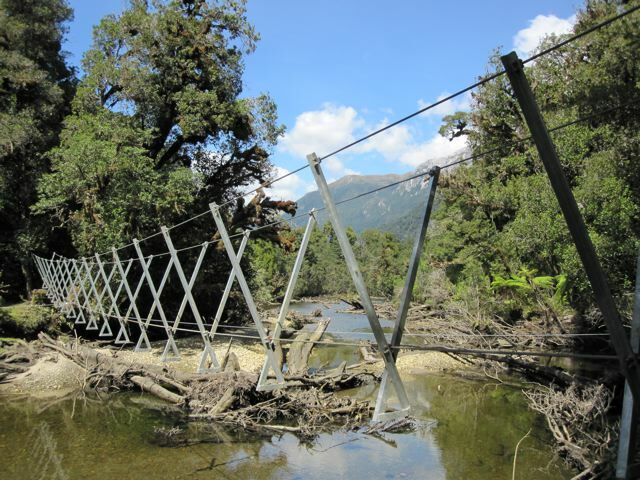 Fiordland is one of the wettest, muddiest, most sandfly-infested areas you are ever likely to encounter. My advice is to leave your tent at home. If you’re a light sleeper, be sure to bring some ear plugs. The Dusky Track is a challenging route, suitable for experienced and appropriately-equipped hikers. Apart from the beautiful scenery, I loved the solitude and the challenging nature of the terrain. One of my favourite hikes in New Zealand. Even though you are unlikely to see a lot of other hikers, chances are you will be sharing the huts along the way with at least a few other intrepid souls. Indeed, one of my fondest memories of my Dusky Track experience, was laughing and joking at days ends with fellow trampers. Not surprisingly, much of the humour was related to the mud and rain. It’s difficult to exaggerate just how much of it there really is! Welcome to the Dusky Track! Thanks for the kind words, Peter! Look forward to catching up back in Australia. Beautiful, but I suspect it will remain less populated, given the weather. Good for those who treasure solitude and gloom! I’ve just put it on the list. It’s a great hike and with the right mindset, not too gloomy! For those with the experience, it makes for an excellent alternative to the more popular Fiordland hikes such as the Routeburn, Milford and Kepler Tracks. Late April will bit a bit cold but i havent worn my alpine gear for a while now.